On the other side of the road, as you enter Virginia from Maryland, the same signs tells you that "The South Begins Here." 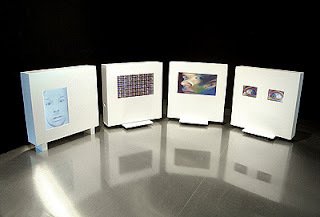 Read a terrific interview at authentic art visions. Go to this DC opening on Wednesday! Gallery 101 over at Georgetown University has a must see show opening tomorrow with an opening reception on October 15 from 5:30-7PM. 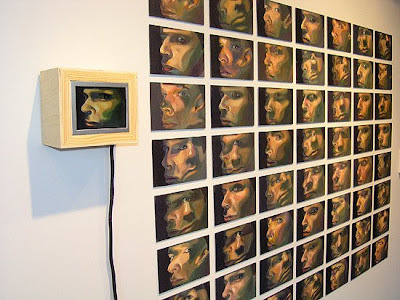 It is Introspection, animated portraits by Scott Hutchison. Hutchison has been working for years now in his animated portraiture, where he combines portrait painting and traditional animation techniques with digital capture and editing tools. Essentially Scott analyzes facial expressions and then paints each moment of the expression frame by frame. Yep... each frame of his videos is an original painting. Then these hundreds of small individual portraits become the cels for looped animations that truly open up the personality of the sitter. This is the sort of innovative work that for years now has been building the bridge between traditional painting and video, and which in most other cities would have already come up to the attention of local museum curators. If you want to see something truly different and new, check out Hutchison over at Georgetown. Gallery 101 is located in the Walsh building of the University, between N and Prospect Streets in Georgetown. The show runs through December 5, 2008.